Privacy plus seclusion on approx. 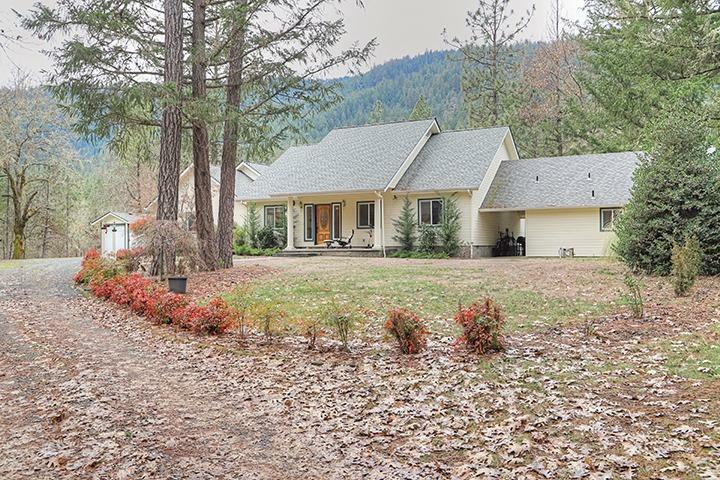 53 flat-creek-bordered acres through solar powered front gate minutes from downtown Rogue River with boutique restaurants and major grocery store. Cross your own private bridge over Evans Creek to classic 2, 088 sq ft, 3 bedroom, 2 bath home with new roof, HVAC system, carpet and interior paint. Kitchen boasts stainless appliances, wood cabinetry and granite countertops. Master bedroom offers cozy propane fireplace, unmatched view, twin sinks and two walk-in closets. The property also offers a 1 bedroom, 1 bath cottage, 36x40 workshop, nature trails, and so much more! Come see for yourself! All information is deemed reliable but not verified; anyone considering purchasing this property should perform their own investigation into the uses and condition of the property. Directions: Take Foothill to W Evans... the property is on the right side of the road.